And repeated links to an organisation mostly comprised of individuals who were expelled from the SPGB for persistent undemocratic behaviour is a thorn in the side for some of us. this article page seems to ask if I want to run a Microsoft Office 2010 component. Has it been hacked? Has it been copied and pasted from a compromised Microsoft Word? Present: Mandy Bruce, Dave Chesham, Rob Cox (Treasurer), Dan Fabian, Shannon Kennedy. Motion 1. Chesham/Cox, "That Kennedy be chair." AGREED 4-0-1. 2. Apologies for absenceMarie Chesham, Hannah Dutton and Niall Murray. 3. Confirmation of agenda itemsConfirmed. 4. Adoption of minutes of previous meetingMotion 2. Chesham/Fabian "That the minutes be adopted." AGREED 5-0-0. 5. Matters arising from the minutes of previous meetinga) Folkestone Socials/SS Sales (Lime Bar Cafe)Cox reports Standard sales for May of 5 copies. Cox passes round poster of forthcoming events at Lime Bar. b) Hip Hop Music NightCox reports that Cde. Kirk is to contact the bar man at Lime Bar to discuss proposed arrangements for a Monday evening. c) T-Shirt & Bags: Costing of possible further order for bagsCox has not yet found time to get costings for bags. Cox discusses the possibility of placing a further order for t-shirts as some of the sizes are now out of stock. Cox will appraise current stock levels more fully upon next visit to head office. d) Motion to EC. “Advertising the SPGB in areas where we have active members and branches”. Deferred from May for further considerationCox suggests taking advertising in the Kent Messenger group of Papers and shares the circulation figures for the various publications. Cox agrees to get costs for a quarter page advert in the Maidstone, Dartford and Canterbury editions. e) Canterbury Discussion GroupDeferred to July, pending further information from Cde. Kirk. f) Sheppey Promenade FestivalBruce agrees to contact the organisers regarding the booking of a pitch at the event. A budget of £40. is agreed to cover the any pitch fees. g) Canterbury Pride 9th June – ReportBruce, Cox and Kirk attended but Kirk was unable to meet with Bruce and Cox due to problems with mobile signal which meant that they where unable to locate each other at the event. Cox reports that he and Bruce set up at the festival entrance and leafleted attendees coming to and from the event. Many leaflets where distributed. 6. Correspondencea) Assistant Gen. Secretary and Other – Podcasts Conference Resolution Cox reports that a floor resolution has been passed with regard to the conference resolution. This has been referred back to KSRB. MembersCorrespondence has been received from Cde. Shodeke.This is discussed amongst members present. Motion 4. Chesham/Fabian, "That Cde. Shodeke’s points be raised with the E.C." AGREED 5-0-0.7. Notice of Business (Bruce)a) That Cde. 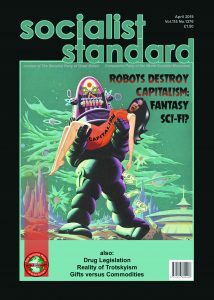 Buick's article “What Would a Real Socialist Revolution Look Like?” from October's Standard be published as a brochure for free distribution at literature stall and events etc.Deferred.b) “The use of a recent piece from the January Standard giving the “Case against Capitalism” as a free handout”Deferred. Minutes from May are passed round by Cox.4.30 pm. Kennedy leaves meeting. 10. Future Propaganda ActivitiesIt is agreed to hold a literature stall in Canterbury on June 30th.Cox suggests asking Kent Miners Festival if SPGB can have a stall outside the main tent as there where no pitches available inside upon recent enquiry. Part Two: Discussion“The plan for the adoption of Socialism”Cox to email Kirk as to whether he still wishes to keep the discussion item on the agenda. This reply was modified 6 months, 3 weeks ago by gnome. This reply was modified 6 months, 2 weeks ago by Matthew Culbert. Whilst on a visit to the North East a member from Cardiff will be attending the Durham Miners Gala and distributing leaflets there. Are any members from the region available to join him? Excellent four hours in Canterbury today with wall to wall sunshine. Several interesting conversations, four pamphlets and one Standard sold; several back numbers given away and about three hundred leaflets handed out. Three members present. Should happen by default – check your settings. Yeah, yeah, yeah! Wait ''til you get to my age and you can't remember where you've put anything, never mind remember how to 'do' a tinyurl and insert it onto a forum, searching for the correct character, etc etc.I don't do funny faces and all that either – too much to learn and then remember for the next time! If I gave you a laugh, well that's fine – we all need one or two a day at least.J. Apparently you can't any longer unless you're an existing user. No offence meant Janet and I suspect I've already got to your age! Our 100,000 brochures will appear as the only insert in the i newspaper (South edition) next Thursday, 28 June. 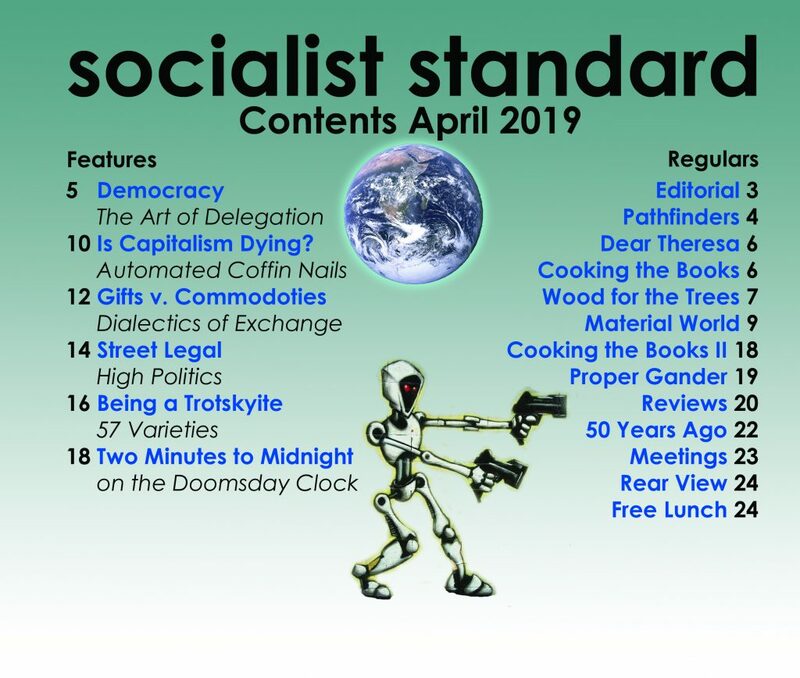 Which is today and already three phone calls received at Head Office requesting information packs and 3 free issues of the Socialist Standard. https://www.commondreams.org/news/2018/06/27/how-did-she-win-laser-focused-message-economic-social-and-racial-dignity-working?utm_term=How%20Did%20She%20Win%20With%20a%20%27Laser-Focused%20Message%20of%20Economic%2C%20Social%2C%20and%20Racial%20Dignity%20for%20Working-Cass%20Americans%2C%27%20Explains%20Ocasio-Cortez&utm_campaign=Daily%20Newsletter%20-%20During%20Fundraiser%20-%20WITH%20Fundraising%20Message&utm_content=email&utm_source=Act-On+Software&utm_medium=email&cm_mmc=Act-On%20Software-_-email-_-News%20%2526%20Views%20%7C%20With%20Supreme%20Court%20on%20the%20Line%2C%20Democrats%20Told%20to%20%27Stiffen%20Their%20Spines%27-_-How%20Did%20She%20Win%20With%20a%20%27Laser-Focused%20Message%20of%20Economic%2C%20Social%2C%20and%20Racial%20Dignity%20for%20Working-Cass%20Americans%2C%27%20Explains%20Ocasio-CortezJust interested in running capitalism in a (marginally?) different way.Sorry about long link, don't know how to change it to post on here! Are there any plans to resume the promotion of this video via adwords? Wasn't it supposed to resume in February? Has the EC recinded its decision to spend 1K on it as suggested by the 2017 Audio Visual Committee? The Executive Committee agreed today to spend a further £250 promoting the video on Facebook.